My team has been struggling with communication. We have talked about it all, run through problems and nutted out imperfect solutions. We have talked through positive ways to communicate, but I am still seeing two things. Personal frustrations evident if someone is constructively criticized. People jumping to conclusions and throwing others under the bus when they are criticized. Do you have any tips I could use to start getting people to just understand what is going on and react positively? Acceptance seems to be a huge issue. I do not want to be condescending at all and I fear that is the way I will go as I see the same behavioral patterns continue to emerge. Thank you for your email and congratulations on working to improve communication with your team. I appreciate your collaborative approach. Your interest in behavior patterns is important. Replace negative patterns with positive behaviors to solve nagging problems. Established patterns – good or bad – tie directly to leadership. I know that stings. We can’t blame others for persistent patterns that we tolerated. Ask your team, “What would you like me to do or say when we don’t follow-through with our commitments?” Generate specific language and behaviors. Try something new for a couple of weeks. Discuss how it worked. Adapt. Adjust. Start again. The only true accountability is self imposed. Ask team members to make commitments for which they are willing to be held accountable. Then do it. You might buddy up. “Who is your accountability partner on this project?” Two are better than one, if they encourage each other. Since talking with the team hasn’t worked well, you might identify two or three respected team members to work with. Who might begin exhibiting the behaviors you hope to see? Call them together. Discuss how to make things better. Determine what you’re going to do. Focus on things within your control. After listing behaviors that might break a pattern, choose one to practice. Build a culture where seeking feedback is normal. Don’t ask for broad unfocused feedback. “How could I be a better leader?” is a tragedy waiting to happen. Praise in public. Offer constructive feedback in private. Use the term feedback instead of constructive criticism. It’s a small thing, but I think ‘criticism’ has more negative baggage than ‘feedback’. Affirm three times as much as you correct. Enter every room looking for good behaviors to notice. Say what you see. Leading is learning. You tried something. It didn’t turn out like you hoped. What are you learning? What will you do differently? 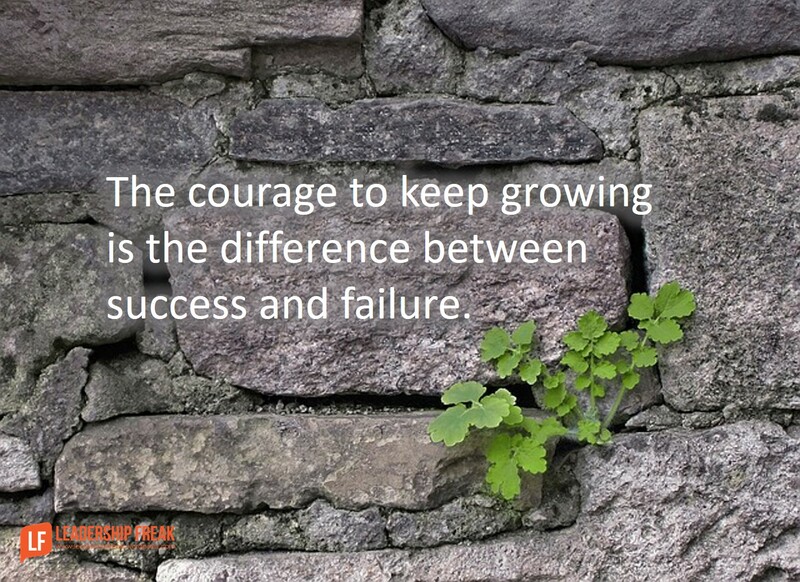 The courage to keep growing is what separates success from failure. Thanks for a great question. Your passion shines through in your words. What suggestions do you have for this team leader? I see “accountability” a key component, mixed with a focus on the teams “mission”. Common bonds need developed and may help the process. Taking statements out of context can create a disillusioned vision. Clarify your intent perhaps would eliminate misunderstanding what is being conveyed. Patience needs to develop perhaps learning to listen to others totally. Identify distractions in the group and work on a system to alleviate the problem. Communications without listening and understanding often times become misunderstood messages. Thanks Tim. Your inclusion of “mission” is so helpful. You remind me that we can work really hard without a clear picture of what we are working to achieve. It’s more common than you might think. The other thing that really speaks to me is listening. My best tip for listening is simply to be quiet. Active listening is out of reach until we learn to hold our tongue. This is really good stuff. I am counseling a couple who are having communication problems, have for years. So this works even [especially?] if the “team” is two. I will be forwarding this to them. Thanks! Thanks Pete. It’s wonderful that leadership principles apply in many contexts. I often see people saying these ideas apply to their family life. Our Team leader should work on simpler things and which are self-evidencing. “accountability” is much harder. Here’s my story. Hope it helps. In 2006, I landed back in India (after 19years) in the USA and after abaout 6months, I was a given a 25-member team of average age 22year. I had been to a behavioural outbound training a month before, where the coach was always talking about Trust. Being mostly a techie, I didn’t know the first thing of how to build trust in a team. So, I was just nice – patient but kept experimenting – making sure our project location was hospitable and team space clean and quiet. All these are hygiene conditions – doesn’t directly help on timely delivery. I tried measuring trust (mostly thru 1-on-1 conversations) and was exasperated. In that despair, I realised “trust” is something I wanted and asked the question what does the team or an individual in the team want ? They wanted to build a career and they need to convince themselves, working with me would help them ( I called it “value”) . I did that. The team got value and I got my trust. After my first team meeting, I got feedback that team meetings were waste of their time! So, I kept it to four sentences on the whiteboard and 4minutes. Anybody could come at anytime and ask me for updates. I ensured resource sharing at first, then information sharing and finally knowledge sharing. 1. create a conducive (safe, supportive, and stable) environment. 3. group interactions / team delivery can then become stable. Thanks Chakradhar. You provided a moment of enlightenment for me. I think if I want trust I should give trust. That’s generally true. But, your comment suggest that people may need something different that what I want to receive. Provide value – earn trust. Your idea opens the conversation to some interesting possibilities. Thanks Dan. Would love to discuss further. my second Provide- Earn learning was …. Provide “competency building” – Earn “project performance”. These are good suggestions for the team as well as the leader. In many instances, team members must have serious leadership courage to speak openly and face the issue directly. It’s my experience that these excellent practices should be prefaced with a discussion on safe environments (which you touched on a little above.) Folks need to feel safe speaking up. Sometimes it’s less about communication and more about safety. Thanks Stephanie. I’m glad you brought up safe environments. Leaders play a central role in make it safe to speak up…to speak the truth….to disagree…to offer constructive dissent…to make mistakes. I think a “what are we learning” approach is helpful. Another help is committing to seek the highest good of others. It is very hard to provide safe environments. I still haven’t found one in an organisation, outside my home. I take my risks/ chances to speak (like a cowboy !) and have a fair share of bullet holes in my body politic! Dan, Great question from the aforesaid team member! I can relate. I will echo what you said with a strong focus on “modeling” the behavior. I will share my own experience, from a similar situation at work. I started by telling my followers what to do, but then quickly realized I was not modeling the behavior myself. Leading by example works, leading by preaching and telling does not. In my own situation, I expected the team members to take risks and implement ideas even if there was a risk of failure. I demonstrated the behavior by acting on some process ideas and failing on a few of them. I openly shared where I succeeded and where I failed. The team members started taking risks as well, and the team culture started changing. Modeling the behavior might be a great place to start. Thanks Niraj. Great illustration. Congratulations for moving from telling people what to do to modelling the behaviors. Thanks for an encouraging story. Does the team feel safe? If the previous leadership style was something along the lines of “the beatings will continue until morale improves”, it can take you a long time before people feel safe enough to communicate without feeling defensive. Safety is a multi-level issue. I feel safe when I do something by myself of my own volition. Safety in inter-personal relationship is whether communication is consciously happening (2-way, active listening kind of way, supportive; and of course, ABC – accuracy, brevity, clarity). Then, I will have my own independent voice. Safety in team is a phenomenally different level of behavior. I could be safe in my relationship with my boss but not in the team! some, rarely, could also feel safe rather in team and not with boss! Safety in organization context will be evident if there are organizational processes capable of absorbing values from individuals !! Many times, I feel very safe in some parts of the organization and not in others! Almost always, micro-cultures (or shades of culture) exist that could make safety a fleeting attribute.